Williams Lake, B.C.- It was not your usual crash, and the rescue mission was out of the norm as well. This week, a stage coach and the team of horses pulling it, went off a road, and rolled 40 feet down an embankment near Farwell Canyon. To add to the challenges, a recent large mud slide compounded the rescue efforts. 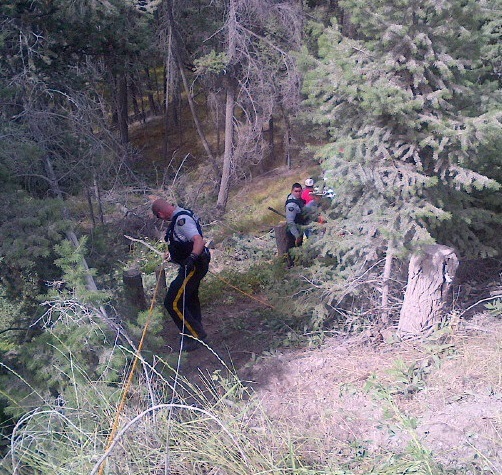 Alexis Creek and Williams Lake RCMP along with Search and Rescue and the Air Ambulance responded to the scene. There were six people on the stage coach, two were able to walk to the top of the embankment on their own, four others were sent to hospital where three were treated and released, the fourth person was in serious condition and had to be admitted to hospital for treatment. Fortunately all the individuals involved in this accident were conscious when rescuers arrived, says Corporal Madonna Saunderson, spokesperson for North District RCMP. Our police officers and Emergency Health Services worked together to stabilize the injured and secure them on stretchers. Then because of the steep slope, they used ropes and a winch from the police car to bring them safely to the road. Sadly we had to put down one of the horses involved in the accident, after receiving permission to do so from one of the elders involved in the ride, says Cpl. Saunderson. The horses and stage coach were taking part in an annual ride which was to culminate at the start of the Williams Lake Stampede. Reported elsewhere as a wagon not a stage coach.